mQFX, also known as "microQ Effects", increases the audio impact of media players with a powerful set of enhancements that will set your products apart from the crowd. mQFX is a very compact, high performance software digital audio processing package drawn from QSound Labs’ leading edge microQ™ digital audio engine. The microQ engine powers portable communications, utility and entertainment devices with features that include wavetable synthesis, full positional 3D audio and multi-format audio playback capability. mQFX shares with microQ inherent modularity, scalability and portability. You can easily choose the functions that suit your exact product application. 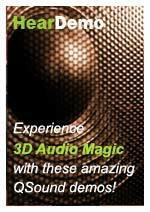 • QXpander® 3D stereo sound stage expansion. • QEQualizer™ fully parametric spectrum control with presets. • QSizzle™ dynamic high-frequency enhancement. • QRumble™ dynamic low-frequency enhancement. • QAutoLeveler™ automatic gain control. • QXtremeVolume™ handset speaker volume maximizer. • QDRC™ dynamic range control. • QLimiter™ anti-saturation dynamic range control. • QNDVC™ noise dependent volume control. NEW! Proprietary QXpander 3D spatial processing literally adds new dimension to music playback, expanding the sound stage beyond the physical limitations of speaker locations, and expanding the acoustic image outside the listener’s head when listening with headphones. This results in a more natural and less fatiguing listening experience. 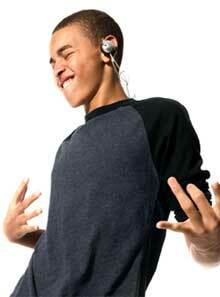 QXpander employs purpose-specific algorithms for maximum spatial impact on headphones or speakers. Speaker-targeted 3D processing is optimized for narrow speaker geometries and can be OEM-tuned for peak performance on front, rear, and side-firing speaker configurations. An adaptive mid to high-frequency spectral enhancement, QSizzle restores a natural-sounding sonic punch to highly compressed audio formats like MP3. QSizzle selectively adds upper spectrum energy according to the real-time characteristics of the input signal. The result is lively, sparkling highs without the strident, harsh side-effects of simple frequency boosters. The low-frequency counterpart to QSizzle, QRumble also adds energy in a selective fashion, bringing substance and warmth to the low end of the spectrum without overloading on loud passages. QEQ is a sophisticated, highly flexible, fully parametric tone control. Depending on the form of the code provided, either compile time or run time options exist for the number of stages and the filter type, bandwidth, frequency, and fully-symmetrical +/- 18dB gain for each stage. This enables a wide variety of responses to be created, even with resource-light versions using only two or three stages. Example applications include simple bass and treble controls, a multi-band “graphic” equalizers, professional-style parametric equalizers or and special-purpose embedded filters, e.g. for speaker response compensation. Presets to suit various music genres are included. Using QSound Labs desktop software tools, these presets may be customized, added to, or optimized for the hardware by QSound Labs, the system integrator, or a third party. QXtremeVolume is designed to maximize the loudness of the ringtones played through the handset speaker. Several dB of increased sound pressure level may be realized from typical ringtone material without clipping the signal. The user enjoys increased audibility in noisy environments, yet annoying and potentially speaker-damaging signal distortion is minimized. Broadly effective in its stock configuration, QXtremeVolume may be fine-tuned by QSound Labs to optimize results any specific platform. QAutoLeveler is an automatic gain control that passes loud signals unaltered, and applies a dynamically-variable boost to quieter passages or sources. The result is greater consistency with reduced need for the user to readjust playback level. Quieter material may be heard over background noise without high-energy content becoming too loud. While true normalization requires a complete prescan of the content, QAutoleveler does not, yet achieves sonically similar results without significant delay. Therefore, like dynamic range compression, QAutoLeveler is suitable for all input types including streaming signals. It is subjectively more transparent to the listener than compression at moderate settings, and is far simpler to configure: it has only a single continuously-variable control that may be exposed in the user interface, or preset by the system integrator. Noise dependent volume control adapts dynamically to ambient noise in the listening environment to ensure maximum audibility. Dynamic range control boosts soft passages to prevent them from being lost against ambient noise and reduces the need to adjust controls. A high-efficiency, anti-saturation dynamic range controller, QLimiter andles any combination of signals and extreme effects settings, eliminating output distortion with surprisingly little CPU bandwidth. 3D acoustic environment simulation enables users to place their music in the sonic context of choice, with presets for stadium, concert hall, club and more. Inherently portable, microQ and mQFX are written in highly-optimized C++ using fixed-point math, and feature the unique combination of small footprint and high efficiency that is the hallmark of QSound audio platforms. An optional C interface is also available. Modular, scalable components make mQFX readily adaptable to any target environment, with the requirement for platform-specific code reduced to input and output interfaces. mQFX is currently available for DSP and RISC architectures, including ARM® and enhanced ARM architectures running Linux, Symbian OS®, Nokia® Series 60, Microsoft® Windows Mobile. mQFX can be provided in the form of object code, or custom ported by QSound Labs to suit your specifications. mQFX can be implemented at various system levels, e.g. within a driver, as a plug-in or as a user application.